Turnip greens are the top, leafy green part of the turnip plant. They are a member of the cabbage family, along with collards and kale, and offer an amazing array of vitamins and minerals. Want healthier hair and super skin? Eat more turnip greens! 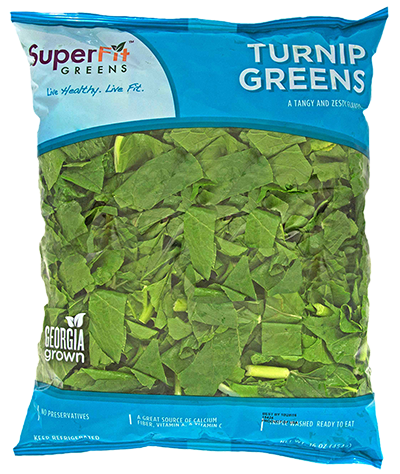 Packed with calcium, vitamins A and C, and iron, turnip greens provide a number of health benefits. Having turnip greens as a regular side dish for dinner can help promote better digestion, higher quality sleep and mood, and improved bone health. Turnip greens are delicious when seasoned with a ham hock, or with garlic and onions. They can be steamed or boiled and served with the traditional staples of beans and rice. Slightly cooked turnip greens can also be juiced for a nutritious and tasty drink!